FOR THE STAR OF DAVID? Shield of MAGAN? or Shield of MOGAN? In the Sumerian language 'MAGAN' = Egypt. 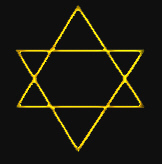 Today the Jewish 'Star of David' is called the 'Mogan David', or the shield of David. According to Zecharia Sitchin, in 'The Wars of Gods and Men', page 180; "Jerusalem - Ur-Shulim, the City of Shulim, meant 'The Supreme Place of the Four Regions', and the Sumerian emblem of the Four Regions applied to it, [and was], possibly the forerunner of the Jewish emblem called the 'Star of David'. Emblem of the four regions at left. Magan, Egypt: Magan was an ancient region referred to in ancient Sumerian cuneiform texts, of around 2300 BCE, as a source of copper for Mesopotamia. The location of the original Magan is not known, but some archaeological and geological evidence suggests that Magan was part of what is now Oman. HOWEVER, Betty Rhodes believes that the original 'MAGAN' was in the Sinai Peninsula where extremely productive copper, as well as another copper related mineral - the blue-green turquoise, mines were located. Even today, the ruins of these old mines and tell-tale inscriptions of the Goddess Hathor, aka ISIS - Lady of the Turquoise, can be found in the Sinai where these ancient mines were located. Copper and turquoise mining in the Sinai Peninsula continued until the reign of Ramses III, and in Egypt, as well as all throughout the Mesopotamian Valley, both minerals were highly prized and desired commodities. The map above by Betmatrho, depicts the ancient copper trade route - notice how it forms an inverted 'V', much like one section of the ancient Mesopotamian Star. The precious minerals and gemstones of ancient times have been severely under-rated when seeking the origins of word meanings. In the Middle East, the Sumerian city-states comprised the first great metal-using civilization. The Sumerians navigated the Euphrates River for commerce, including the transportation of copper from Armenia to the north. 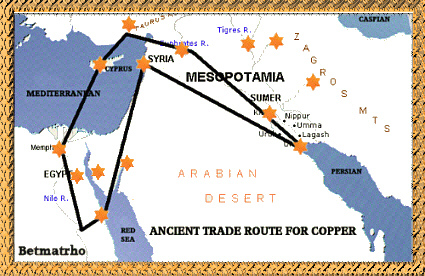 The Sumerian word for copper, "urudu", is the same word for the Euphrates, literally, their "copper river" trade route. 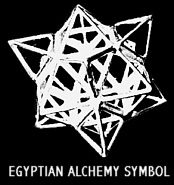 Could the 'Star of David' have originated with the ancient Egyptian Alchemy symbol? The Shield of David is named after the famous King of ancient Israel - King David. Today it is easily recognized as a symbol of modern Jewish culture. 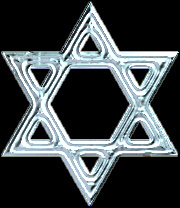 It is said that the usage of this star symbol began in the Middle Ages - perhaps after 1000 CE when the religion of Judaism took root with the Khazars from Eastern Europe. With the establishment of the State of Israel in 1948, the Star of David on the Flag of Israel has also become a symbol of the state of Israel, as well as representative of the Jewish people and Judaism. 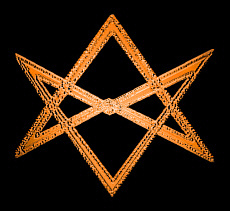 Many forms of this STAR symbol can be found within the lost tribes of Israel among the Celtic, British, and Anglo-Saxon cultures.